Go to Blogger Setting Edit Template Backup your template before making any changes. Search for </head> tag and add the below code just above it. From the above coding, just replace https://www.yourblogurl.com with your blog’s URL and save your template.You should also replace the .js script if you already have jquery into into your template. Now this plugin would automatically add nofollow attribution as well as target="_blank" to your all external links except your own domain. While writing a post, it is extremely straightforward to add a nofollow attribution to the external link and open it in a new window. Adding nofollow attributions manually to your all external links is indeed a mind-numbing task, but that might not be preferred all the time. 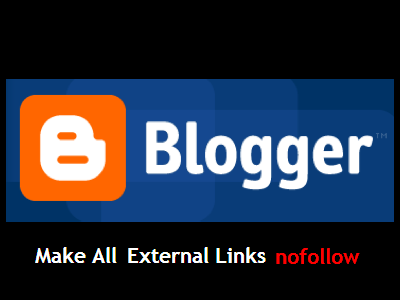 Sometime you might have to make a link dofollow, but you can’t because your manual attribution would override your settings.So here we made the modest solution to add nofollow attribution automatically into your blogger blog,hope you'll like it. This would help your site be free of unwanted links. This is very interesting. Going to do this to my blog. If I add this code now, would it make all my existing links no follow or only the new ones? Many thanks. great share, i didnt know this, awesome!